HEOS Bar is a real 3-channel soundbar with a dedicated center speaker. You will be stunned by the virtual surround effects and the clarity of dialogues. If you add a HEOS Subwoofer and two HEOS speakers as rear channels, you can even create a cinematic 5.1 surround setup, totally wireless. READY FOR 4K ULTRA HD. The HEOS Bar is future-proof with the latest HDMI standards. Four HDMI 2.0a/HDCP 2.2 inputs make sure that you can enjoy your movies in 4K Ultra HD. In case your TV has limited 4K switching capabilities, connect your 4K sources directly to the bar. For the best multi-channel sound, the HEOS Bar offers class-leading audio format support with Dolby TrueHD and DTS-HD Master Audio. Have it all at your fingertips with the intuitive HEOS App. Setup and operation are easy. Simply connect your HEOS Bar to your TV with a single HDMI 4K compatible cable with Audio Return Channel (ARC). Within minutes, the soundbar is ready to perform. Control all your sound via the app, or command the HEOS AVR with the included HEOS remote control or your TV remote. Listen to your personal music collection throughout the whole HEOS ecosystem, even in high-resolution. 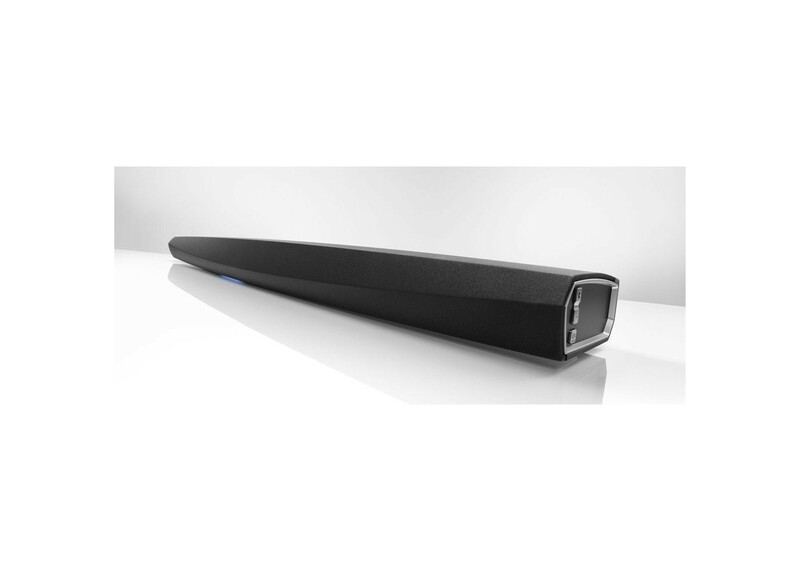 Slimline soundbar, designed to improve the sound of the largest TV sets with 50+ inches. Bluetooth® Supported: Play on one speaker or add other HEOS speakers in party mode. 6 Quick Select buttons on supplied IR remote and HEOS App for favorite functions and radio stations. Supports all major streaming formats, including high resolution audio: DSD (2.4, 5.6 Mhz), FLAC, WAV, ALAC (192 / 24), MP3, WMA, AAC File Playback (USB / Network). Control basic functions of the HEOS Bar with your television remote for convenience in daily use. Amplification: Bi-amplified Class-D with 6x 2x5 inch oval type Mid Woofers and 3x 1 1/2 inch Tweeters. Wireless Connectivity: Works with standard 802.11a/b/g/n/ac networks on 2.4GHz and 5GHz bands. Wired Connectivity: Single RJ-45 jack for connection to wired Ethernet.